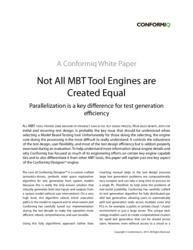 There are multiple processes that have been and are being proposed for making functional test design faster than using traditional manual design techniques. 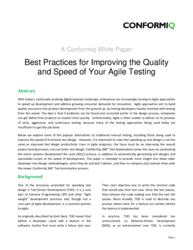 It is primarily in conjunction with Agile development where these methods are getting the most attention. 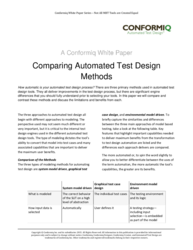 This paper is intended to provide more insight into these older developer test design methodologies, what they do and don’t deliver, and then to compare and contrast them with the newer Automated Test Design process as implemented by Conformiq. 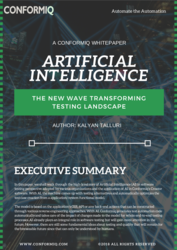 Artificial Intelligence (AI) has become an important aspect of software testing today. 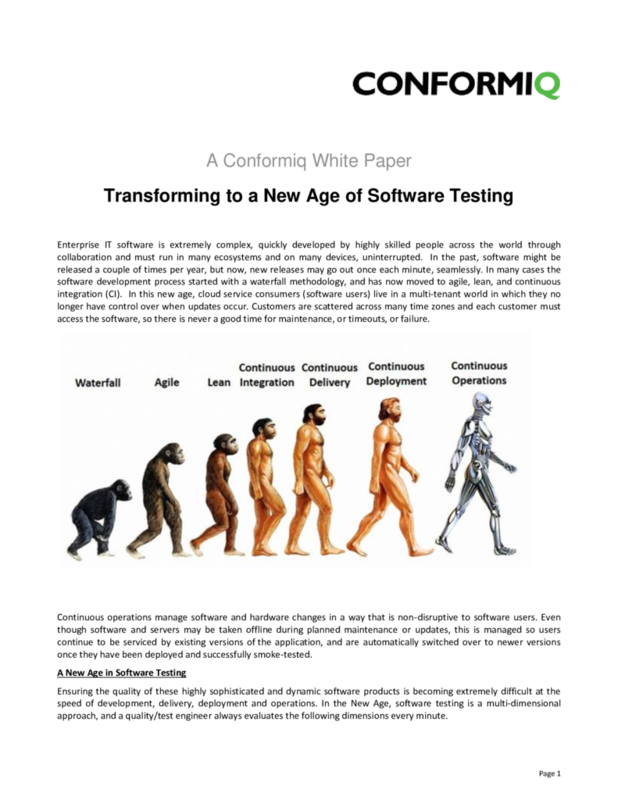 With more and more focus on automation and Agile, adoption of newer technology will act as an advantage. AI and machine learning are typically centered on training software to understand input data versus output today (very similar to typing an input into a field and looking for an expected output). 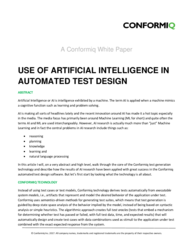 In this paper, we shall learn on how Conformiq is leveraging the technology and automatically generates test automation code and takes care of the impact of changes made to the reference model. 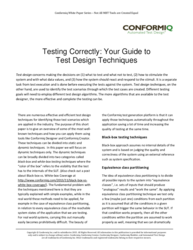 Test design is a separate task from test execution and is performed before executing the tests against the system. 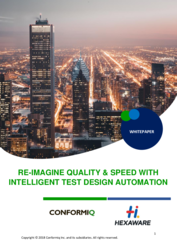 Conformiq powered e2e test automation platform remains one of the key differentiators to most of its partner's traditional automation approaches. This exemplifies “Shrink IT spend and Grow Digital” strategies to its customers and helps them achieve speed with quality. 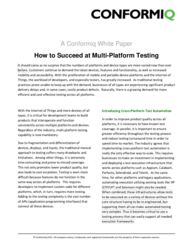 Hexaware is focused on delivering similar benefits and value to its testing customers worldwide through deployment of the integrated e2e testing process described in this paper. 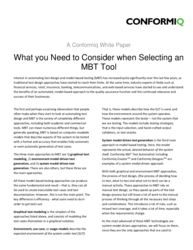 To most engineers the term MBT, for Model Based Testing, usually means using graphical models to be the basis for test generation. While this doesn’t hold true for all the different tools, for those that it does, the usability, capability, and benefits vary widely between them. 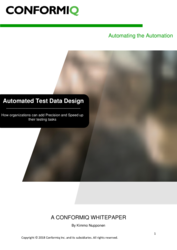 Many tools model the test flows or even the test cases themselves by having the user think of the application flows. Let us take a detailed approach to understand the better tool with right homework and comparison because these tools are very different “under the hood”. 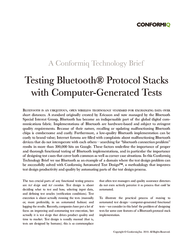 Experimental evidence and practical experience reveal that it is extremely difficult to create sufficient and proper test data for the design of test cases that comprehensively covers the software logic for any non-trivial software system. 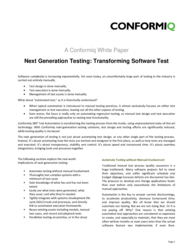 This becomes a major part of test design that takes significant effort, experience and skill to excel manually. Conformiq has changed the scenario! 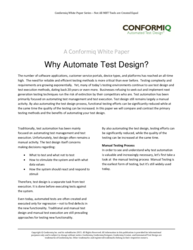 Data design can now be automated to dramatically improve test design efficiency and coverage. Artificial Intelligence or AI is intelligence exhibited by a machine. The term AI is applied when a machine mimics a cognitive function such as learning and problem solving. 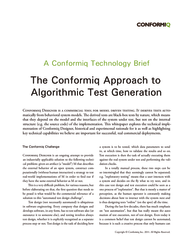 In this article we will, on a very abstract and high level, walk through the core of the Conformiq test generation technology and describe how the results of AI research have been applied with great success in the Conformiq automated test design software. 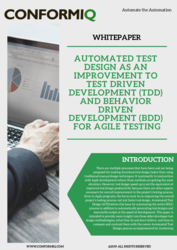 However, test design speed up is not the equivalent of improved test design productivity because there are other aspects necessary for overall improvement in the project’s testing process. 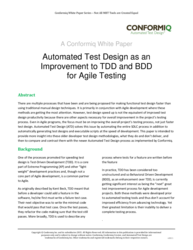 Even in Agile programs, the focus must be on improving the overall project’s testing process, not just faster test design.